Repeatedly calling it the “so-called diary”, Surjewala said every page in it had Yeddyurappa’s signature. He sought an investigation into the report by the newly constituted Lokpal. Yeddyurappa hit back, claiming that the diary was found to be fake by the Income Tax department. 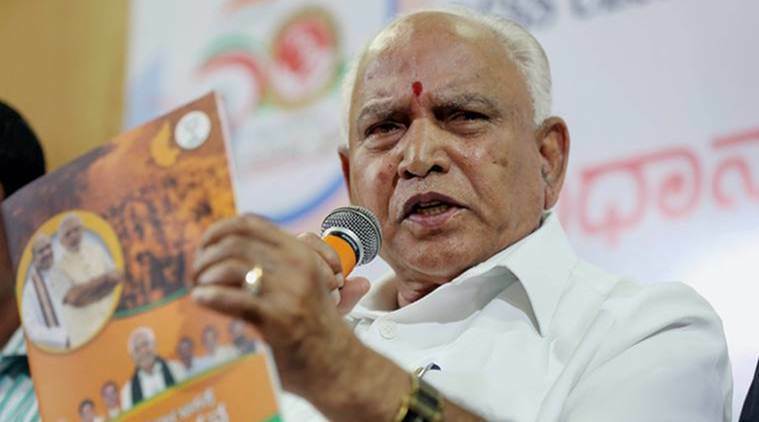 A row erupted Friday after the Congress, citing a report in The Caravan magazine, alleged that former Karnataka Chief Minister B S Yeddyurappa had paid bribes to the tune of Rs 1,800 crore to the BJP leadership. Rejecting the charge, the BJP said the Congress, fearing defeat in the Lok Sabha polls, was resorting to “falsehood, misrepresentation” and a “web of lies”. As Yeddyurappa too denied the allegation, the Central Board of Direct Taxes issued a statement saying the entries in “loose sheets prima facie appear to be of a doubtful nature and were given by the person who was being raided for tax violations”. Congress communication department head Randeep Surjewala claimed that a “so-called diary” seized by the Income Tax department during raids in Karnataka in 2017 showed that Rs 2600 crore was “collected”, of which Rs 1800 crore was given to the BJP top leadership between May 2008 and July 2011 when Yeddyurappa was the Chief Minister. Repeatedly calling it the “so-called diary”, Surjewala said every page in it had Yeddyurappa’s signature. He sought an investigation into the report by the newly constituted Lokpal. “The Prime Minister has to come forward and say whether Rs 1800 crore of bribes were received or not. Each person named in this diary must come forward and say well he or she is not guilty and they are ready to undergo any kind of investigation… this is a fit case to be investigated by the newly appointed Lokpal as the first test case,” he said. Yeddyurappa hit back, claiming that the diary was found to be fake by the Income Tax department. “IT department officials have already probed the issue to find that the documents and handwritten notes and signatures are forged,’’ he said. Congress leaders, he said, “have planted this story… to gain political mileage in the coming elections’’. He said “this is a very old issue… a closed chapter. All the issues raised are irrelevant and false”. Union Law Minister Ravi Shankar Prasad said the IT department had raided premises linked to Congress Karnataka minister D K Shivakumar on August 2, 2017. He said the “fake papers” waved by the Congress were actually “loose sheets” given to IT officials by Shivakumar. “Shivakumar has been involved in such allegations in the past and he made his claims on the basis of a sheet of paper. The Income Tax department department asked him if he had the original copy of the paper but he could not present it,” Prasad said. “The Congress party, whose top leaders are out on bail and are facing many court proceedings, has now resorted to falsehood, misrepresentation and a web of lies… Congress is desperate. In view of the imminent defeat staring it in its face, the Congress party has lost its balance,” he said. The CBDT, meanwhile, issued a statement, saying “some loose papers were given to the raiding party” during the search at Shivakumar’s residence in 2017. “In response, he stated that this was a copy of diary, written by Mr B S Yeddyurappa, and the payments paid on behalf of Mr B S Yeddyurappa to legislators, and received from various leaders, MLAs, Ministers when they were in power. On being asked as to how he got possession of the said loose sheets, in response, D K Shivakumar stated that, being a politician, he procures information about other parties, leaders and members and as the said loose sheets contain political information, he cannot disclose the source of information… He also stated that he did not know the time period in which the said transactions have taken place and that he did not have the originals of the said loose sheets,” it said. The agency said when Yeddyurappa was asked about “the seized material and the statements of Shivakumar”, he said “he was not in the habit of writing a dairy and that the loose sheets in question were not in his handwriting… He further stated that contents of the loose sheets were false and fabricated and his name has been used to malign his political career. He also provided a sample of his handwriting…,” it stated. The CBDT said it had also asked the CFSL, Hyderabad in April 2018 about the procedure and time period of analysing documents. The CFSL, it said, replied that it required original documents.